It's wintertime again. The temperature is dropping. The wind is blowing. And snow is in the air....EVEN in the Southeast. Thinking about a winter vacation with your family? Planning a getaway for a long weekend up in the mountains at your favorite cozy cabin retreat? Know that your Golden Retriever would love nothing more than to be a part of those plans as well. So why not go ahead and take your furry best friend along for the adventure! Like with any well-planned vacation, you'll want to factor in everything you'll need to be mindful of when it comes to your Golden to ensure they have everything to be happy, healthy, and safe. Here are some basic tips on what to consider ahead of your roadtrip this winter. Winterizing your car ----- Always keep all chemicals such as anti-freeze away from your dog. They may ingest some of it and can become incredibly ill. Medication ----- Make sure you have enough medicine for the duration of your time away from home. Pick up any necessary refills for your Golden before you head out. Never leave your dog alone in the car ----- Very cold air in the car doesn’t circulate well and the temperature can drop within minutes to a point where it can become life threatening. Identification ----- Make sure the tags on your dogs’s collar are up to date and fastened securely. Clean up after your dog ----- Always bring plastic bags, gloves, or a scooping shovel. Wherever you stay, don’t forget to clean up after your Golden. Vet records ----- Bring a copy of your dog’s vaccines. Hotels and vacation rentals often ask for proof and dates of all past shots. Find the local emergency Vet ----- Know before you go where the emergency vet is in the area you are staying in case your dog becomes injured. It saves a lot of stress and time in the event that your Golden needs immediate medical attention. Wipe the paws of your dog when coming inside from a walk ----- Ice, debris, and chemicals to de-ice the sidewalks can become trapped between your dog’s toes and in the fur. If your dog licks his feet, he could become ill. Plus, ice tangled in fur can be very painful. Do you have any wintertime travel tips that have worked for you in the past? Any special winter destinations in and around the Southeast that you have as a favorite for you and your entire family? Please share with us at GRRA. We'd love to hear from you. Happy Golden Travels, everyone! Four-legged companions are the best boat-going crewmates one could ask for. They enjoy the ride, do what they are told, and completely shower you with lots of affection. Your Golden Retriever might not immediately take to the water, but with some patience and a little training most grow to love outings on the boat. You will want to be sure that your dog is comfortable in the water before you introduce him to the boat. Allow your Golden to become familiar with the boat and give him time to explore it on his own terms. Once your pet is comfortable, you can begin introducing the sound of the engine. Once your dog is comfortable with the sounds of the engine and the horn, you’re ready to take a short spin around the lake or bay. On your initial mini-trip, it may be better to harness or leash your Golden. The waves and the motion of the boat could cause your dog to slip on the deck and hurt himself ---- or worse could fall overboard. Even if your particular dog is a good swimmer, an unexpected plunge into the water could cause him to panic. Don’t be surprised if your dog becomes seasick. Just like people ---- they have to adjust to the motion of the boat on the water. You may have to get a prescription from your veterinarian if seasickness is a continual problem. 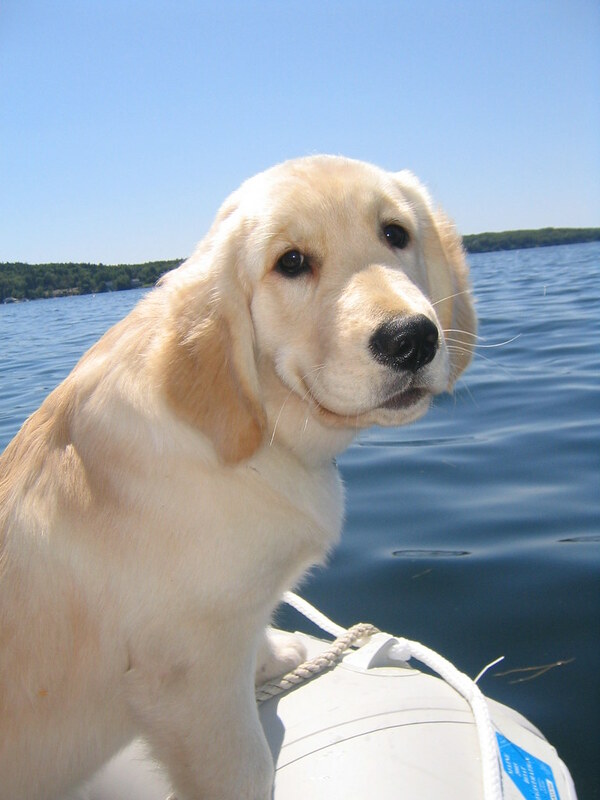 If your Golden Retriever is anxious even after several short boat trips, it is probably better to leave him at home. The stress for both of you can make your boating trip miserable and that won't make either of you a happy camper. Once you are able to extend your outings and see that everything is going smoothly with your Golden, you'll both be enjoying the wind and waves together going forward for years to come. *Life Jacket/Flotation Device ---- While many Goldens are good swimmers, they can very easily become tired and need to rest. The life jacket also makes it easier to pull your dog back into the boat should he go overboard. *First Aid Kit ---- Accidents do happen and it's important to be prepared. *Potty Pads ---- If you won’t be seeing land for awhile, keep some potty pads available on the boat should your dog hear the call of nature. *Food/Water ---- Provide your dog with clean food and plenty of water ---- especially in warm temperatures. *Water Toys ---- If your pet loves to swim, take some water toys along for an extra great time. Now, get out there and have a wonderful and safe boating adventure with your furry best friend. Happy Golden Travels, everyone! Do you take your Golden Retriever when you and your family go boating? Any fun boating adventure stories or pictures you can share with GRRA? Please send them to us. We'd love to hear from you. Happy Golden Travels, everyone! 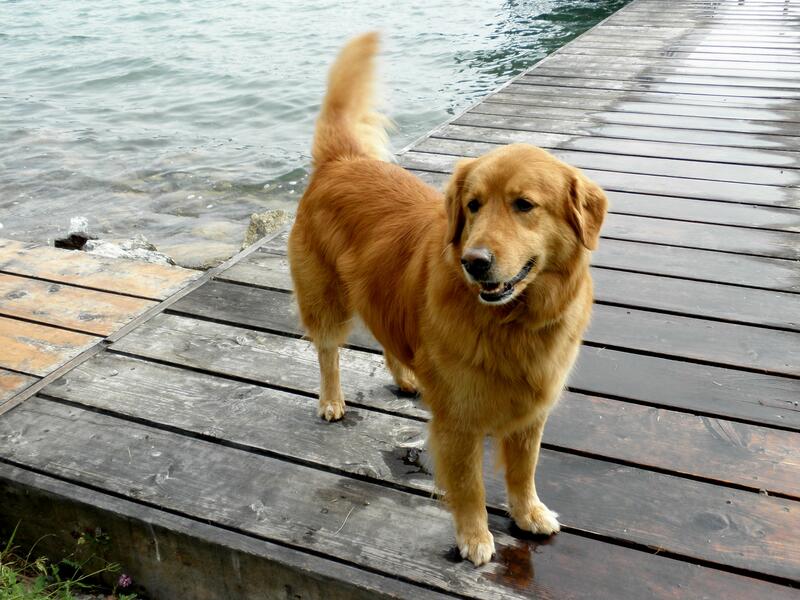 Beach days can be a blast when you bring along your beloved Golden Retriever, but taking a dog to the beach requires some preparation, know-how, and a little common sense. Whether your Golden is running around, jumping through waves, or just laying in the sun, it’s important to remember that anything that can harm you or your family can harm your dog as well. Sunburns, riptides, jellyfish, broken glass, sharp shells ---- All of these things can prove to be problematic for your dog on a beach getaway. It's important to be mindful about what could happen to your Golden and to endeavor to keep him injury-free. Here are some tips that will help your furry friend stay safe at the beach. --- Provide a shady retreat under a beach umbrella, tree, or a make-shift tent to keep direct sun off of his coat. --- Bring plenty of fresh, cool water and a dog bowl wherever you go. --- Have a blanket or towel for your dog to keep his paws off the hot sand or dock. --- Watch for signs of overheating. Symptoms may include rapid panting and drooling, coordination problems, vomiting and/or diarrhea, collapse and/or loss of consciousness. --- Avoid sunburns by keeping your dog off the beach in peak heating times (generally 11am - 4pm). Light-colored dogs and those with pink noses like some Golden Retrievers can sunburn the same way that we do. --- Keep a collar and ID tags on your dog at all times. --- Check with your vet to make sure your dog is up-to-date on all vaccinations and licenses. Lastly, follow all beach rules as dictated by the city or county. Remember that beach rules are actually laws and can be punishable by a fine. Check online to make sure your beach allows dogs before you go and always take notice of any rules posted near the beach. Now that you’re prepared for your beach day, go have some fun in the sun with your Golden Retriever! Do you have any beach trip suggestions or advice to help other Golden lovers with travel plans this summer? Any beach destinations around the southeast that are a favorite with you and your dog? Please send us your stories. We'd love to hear from you. If you are thinking about piling everyone into the car for a close-by adventure to the beach, lake, or mountains --- why not consider taking your Golden along with you? You’ll have more fun. And they’ll certainly have more fun! As you probably know already, that’s what makes your Golden the happiest of all --- simply being together with the entire family. Like with any vacation, there are many important things to consider before, during, and after arriving at your final destination. If you decide to bring your Golden along for the ride, here are some tips on what to plan out, consider, and take along with you on your upcoming family adventure. If you don’t own a single-family vacation home or condo and you plan on renting somewhere, always check ahead for “Pet Friendly” accommodations wherever you’d like to visit. Research helpful websites (i.e., DogFriendly.com, BringFido.com, VRBO.com) for possible destinations or call ahead directly to the chosen location for information regarding current policies on dog breed and weight restrictions. Once you decide on a destination, inquire about any additional charges that might apply for pet and/or cleaning fees at the property where you plan to stay. That way, you won’t receive any “surprises” on your final property invoice or on-file credit card after your trip has ended. Check with your Vet to see if your Golden is completely up-to-date with all of his/her shots prior to your trip. Have an updated copy on-hand of your Vet’s records showing all completed annual vaccinations. Keep your Vet’s direct contact number in your cell phone along with a few pictures of your Golden while you are away from home just in case of an emergency. Important items to pack should include food and bottled water (enough for the duration of the entire trip), food and water bowls, all medications, blankets/dog beds/towels, collars and leashes, plastic bags, treats, and of course --- favorite doggie toys. Ensure all collars have IDs on them with your dog’s name and your correct cell phone numbers. IDs with an out-of-service number or your home phone number are not going to be an immediate help or comfort to you on the road if your Golden does happen to wander away or temporarily get lost. Walk your Golden for about 15-20 minutes before you settle him/her into the car. That will enable the dog to not only do their business but also to calm down as much as possible prior to securing them into their traveling position. Ensure that your Golden is safe in your car by securing the area he/she will be traveling in. This can be done by utilizing a dog crate, a car seat hammock, or a doggie seatbelt --- whichever one is appropriate for the size and general demeanor of your particular Golden. Try to have someone in the car be able to comfortably reach your Golden at all times during the ride to help with any problems that might arise with agitation and/or freight issues. That will make them feel better just to know a family member is there to quickly help them if necessary. Always ensure that the car temperature is warm enough for your Golden during the winter months and cool enough for them during the hot summer months. Also --- when traveling at high speeds on interstate roads and highways --- it’s imperative that you have all the windows closed. This will keep your Golden as safe as possible from any road debris that flies up and hits close to your car. Plan your driving route carefully on your vacation taking into account that your Golden will need a bathroom and/or water break about every 4 hours or so. Try to map out any available safe, grassy areas along the way so your dog can get out of the car, stretch his/her legs for a bit, and drink some water. Once you arrive at your vacation property, it’s important that you let your Golden get the lay of the land before you head out on your own "human" adventures. You want to ensure they are as comfortable as possible within the brand new environment they now find themselves. Walk your Golden immediately --- either within a fenced-in backyard or proper pet relief area --- so they know where to go during their times outside. That will also help you to see where the designated dog sections are on-site as well. Give plenty of time for the extra sniffing and exploring to die down before you leave your Golden in the rental property. Get him/her settled in with favorite doggie beds, toys, and food/water bowels in the part of the house or condo that will be theirs for the duration of your stay. Take a look around the inside of the property to ensure it’s completely "dog safe" from previous owners or renters. Secure any rooms of the house or condo that you don’t want your Golden to wander into for any reason. Make sure there are no random food items or toiletries or cleaning supplies that are where your dog can get to them. Consider leaving a television or a radio on during the day when you are out at different times to help keep your Golden company prior to your return. That will also help with drowning out any strange noises or voices that might be right outside the door, wall, or hallway area. Every year, more and more vacation getaway properties are catering to families who want to bring along their dogs. It is our hope that wonderful trend continues and additional destinations add to their already-existing “Pet Friendly” accommodations in the future. Besides, your Golden is part of your family, right? Right!